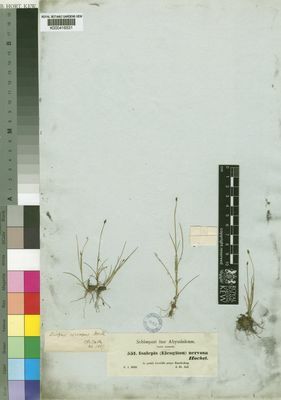 Rhizome horizontal, green and above ground, 4–30 × 0.3–1.2 mm. Culms 1–47 cm tall, 0.2–1.1 mm diameter, with one or more internodes. Bract 2–12 × 0.3–1.3 mm. Spikelet 1, 2.4–9.4 × 0.7–2.7 mm, with 4–28 glumes. Heleogiton fluitans (L.) Link ex Rchb.